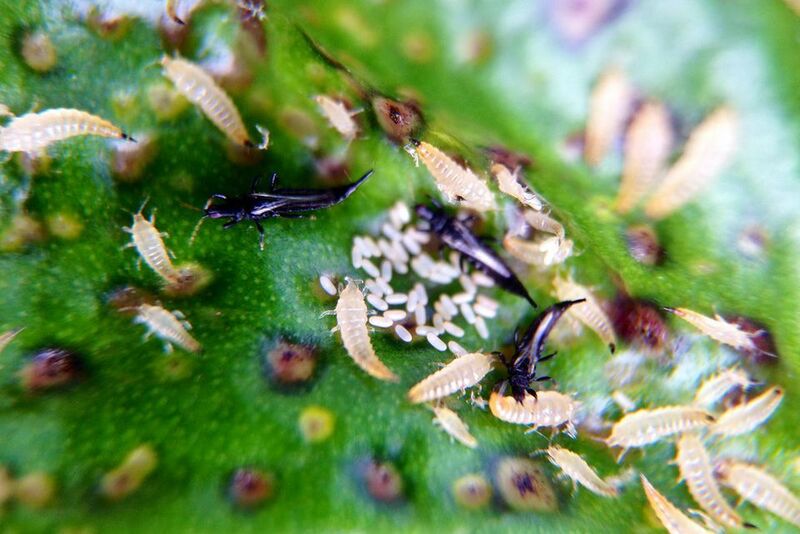 A damaging plant pest, thrips are yellow, brown, or black, these slender, minute insects that are 1/25 to 1/8 inch long, with the females being the largest of the species. There are more than 250 species of thrips that feed on plants in the U.S. and Canada. Common species include the red-banded thrips, Cuban-laurel thrips, greenhouse thrips, flower thrips and gladiolus thrips. In addition, the Chilli thrip has also recently invaded the U.S. Appearing somewhat like worms with legs, the thrips will scurry quickly if disturbed. Adults are winged and can fly. Plant hosts: Thrips feed on the flowers, buds, and leaves of a variety of ornamental plants; flowering plants, such as chrysanthemum, gladiolus, iris; and vegetable plants, particularly onions. They are most abundant in the spring. Damage: When thrips have fed on a bud, it will often fail to open; or if it does open, the flower will be deformed. Flowers upon which the thrips feed may also become streaked and/or discolored. When thrips feed on plant leaves, the leaves will dry out and appear speckled with silvery flakes. The leave eventually wilts and falls off. To lay its eggs, the female thrip will make a slit in a leaf then lay 25 to 50 eggs within it. The eggs can develop into adults within three weeks, or sooner for some species. Many species of thrips also reproduce asexually. They can produce many generations in a single season. In addition to damaging and feeding on plants, thrips are known to bite humans. They can cause both skin and respiratory irritation to people, according to the University of Michigan, particularly to workers in fields where infestations exist. Signs: Thrips leave small spots of varnish-like coatings of excrement on the leaves on which they feed. This can be a sign to help distinguish thrips from other plant pests, such as aphids or mites. One way to determine if a plant is infested is to hold a strip of paper or fabric beneath the plant foliage while gently shaking or tapping the plant. Inspecting any fallen specks with a magnifying glass can help to determine of the damaging plant pests are thrips. Wash entire plant with soapy water (approx. 2 tsp mild detergent per gallon of water). It is important to frequently monitor plants that are commonly attacked by thrips, such as azalea, ardisia, dogwood, gardenia, hibiscus, magnolia and maple. They can also be a problem in peanut fields. To monitor and capture thrips, use blue, yellow or white sticky cards - the optimal color is based on species. The thrip itself will only be seen on very close inspection. Also check areas such as swimming pools and ornamental waterfalls which can provide habitats for thrips. Plants that can withstand high water pressure can be hosed with a forceful spray to knock off the thrips. Pay particular attention to the underside of the leaves. This can be done as often as can be withstood by the plant. Thrips thrive in dry, hot conditions, thus keeping plants well-watered, and regularly misting the plant and its foliage can decrease thrips and activity. It can also be helpful to completely wet, or flood, the ground beneath plants (particularly in greenhouses) to down pupae. Keeping dust and dry ground in the area to a minimum - outdoors and in - can possibly help decrease the thrips potential to thrive and move into the area. Inspect new plants to ensure they are thrip-free before placing them with established plants. It can be helpful to quarantine them first to ensure no less-visible eggs were brought in with the plant. The thrip's natural enemies are pirate and damsel bugs. Why Are House Flies Called "Filth Flies"? How Did Bed Bugs Get in my Couch?